When things get soggy, keep moving with these runner-tested tips! 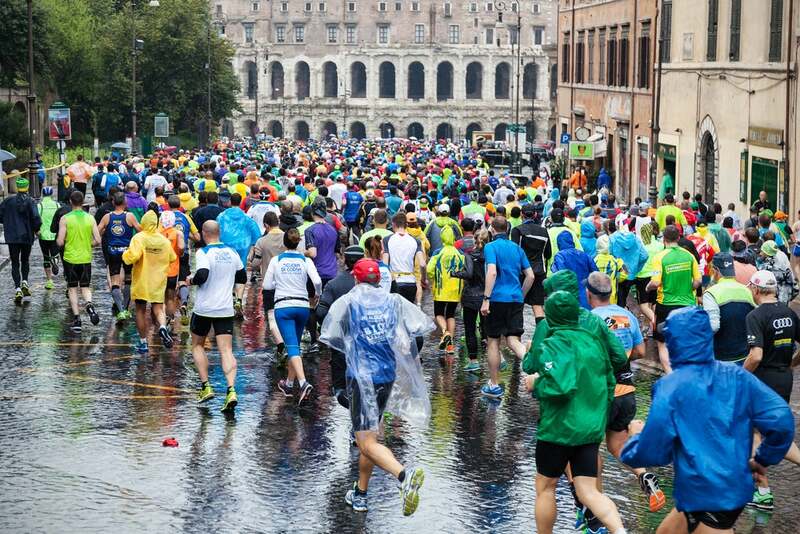 If you have a race on your calendar that’s expected to get a bit sloshy with a strong chance of soaked shoes, we’ve definitely been there and can relate. You can control your training program, food intake and gear, but you can’t control the weather. Rain or shine, the race will go on. You’ve done all the hard work leading up to race day—so don’t let the wet weather stop you from conquering the course. If it’s raining, you’re going to get wet. However, it’s important to stay dry as long as possible before you start running. When you’re clothes get wet, they’ll start to get heavy. If you stay dry before the race, you’re preventing a lot of pre-race weight gain. It’s important to warm up before a race, so try to stay inside as long as possible. Running coach and author of Running a Marathon for Dummies, Dr. Jason Karp, suggests racers sit in the car for a bit longer or find a nearby building or café. Keep warm and do dynamic stretches to loosen up. 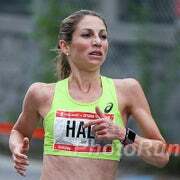 “If you can’t get inside, wear a garbage bag or some other protective layer on top of your racing clothes until just before the start of the race,” says Karp. Cotton or cotton-mixed fabric soaks up water and makes your clothes heavy to run in. Wear dri-wicking material; this way your clothes won’t hold the moisture. Also, make sure you’re running attire is as light as possible. If it is going to rain the entire race, wearing apparel that is light even when it is wet will save from feeling weighed down. Loose shorts tend to ride up when wet—not to mention, they become uncomfortable and unattractive—so the tighter the apparel, the better. This will also help prevent chafing, which will only be aggravated by soaked legs. Similar to the above, avoid cotton socks. Make sure your socks are man-made fibers that are designed for running. Cotton socks will soak up water and make your shoes extremely heavy, squishy and squeaky throughout the entire race—talk about mid-race discomfort. Karp suggests wearing two pairs of thin socks to try to keep your feet dry and to powder your feet, which will help manage the moisture. Use body glide or petroleum jelly anywhere on your body that you think may get irritated. Rain makes chafing worse, so prevent the pain and lather up—even in areas that have never bothered you before. You’re better safe and over-glided than sorry and covered in inflamed hot spots. There’s nothing worse than your face getting wet and the salty water dripping down into your eyes—ouch! Wearing a brimmed hat will keep water out of your face when running. Plus you need to keep your focus on the road to avoid wet potholes and slipping—twisted ankles are worse than rain. Some runners wear goggles to protect their eyes (no, seriously!). You can opt for running sunglasses, and some shades are made with a lighter tint if it’s gloomy outside. You still get the raindrop protection but don’t feel like you’re dipping into darkness the whole time. This will help keep your shoes dry, which will help prevent heavy feet and blistering. Just make sure you spray your shoes about 24 hours before the race so your shoes can dry in time. If you don’t have a rain-specific jacket, that’s okay. You can go to any drugstore and get a poncho, fold it up, and place it in your run pocket or fuel belt. If it starts raining, you can throw this on to help you stay dry. If you run with music, make sure you wrap your iPhone or iPod in a waterproof case or plastic baggy to avoid it from getting wet. If you’re fine without music, it’s best to leave it at home. Pack an extra set of clothes to change into post-race—just make sure it stays dry! It’s important to keep warm once you cross the finish line to avoid muscle stiffness and coldness. Plus, you want to be comfortable at the post-race party. Throw a towel in your car or checked bag as well. 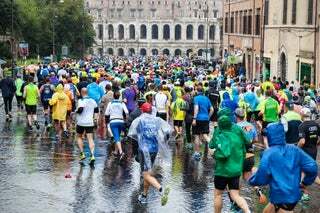 Participant safety is a race’s number one concern and sometimes weather can quickly escalate from a light rain to thunderstorms. Make sure to stay connected on race day by checking the event website, Facebook and Twitter feeds. This is the best way for race officials to communicate race day updates or alerts.